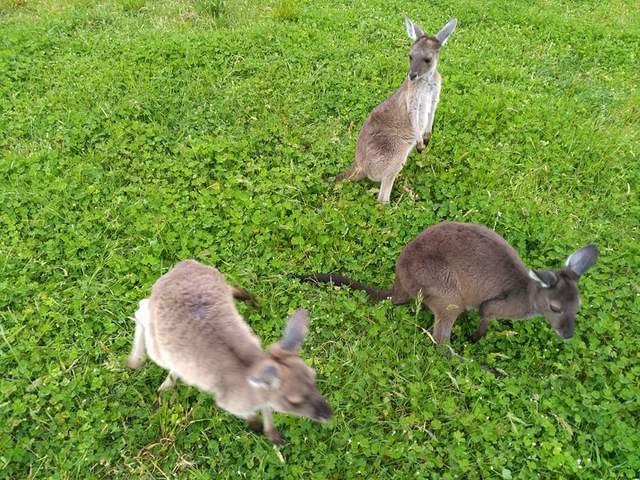 The Australian Dream : Volunteer to help kangaroos !steemCreated with Sketch. 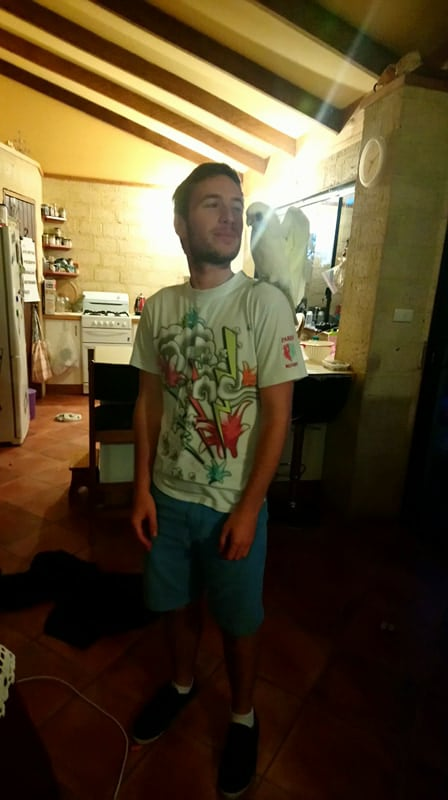 We arrived at Sharon's house who collects injured animals or baby kangaroos who lost their parent. 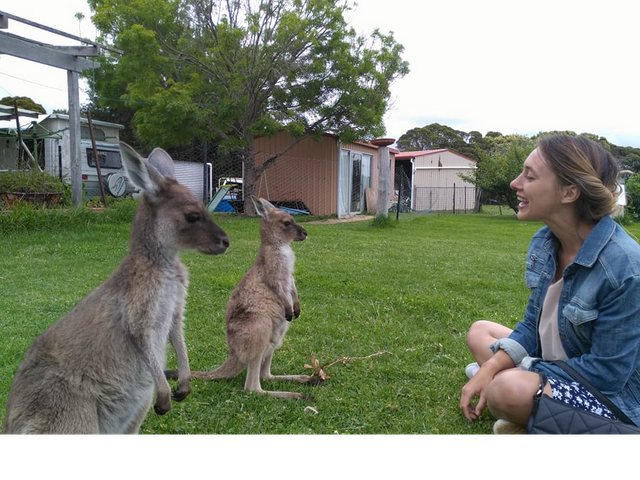 We meet her 3 kangaroos. we are volunteers to help Sharon to take care of wild animals and release them in the future. But before, little backwards. We are a few kilometers from our host and our GPS indicates an orange-red dirt road (very common in Australia). We decide to take this route and drive at 30km by hour with our van. To our surprise many vehicles take this path and we are doubled by small city cars traveling much faster than us. Morality, we still have a lot to learn about Australia and its people. Hardly arrived that Sharon introduces Irvy and Sissy (the smallest), two baby kangaroos. 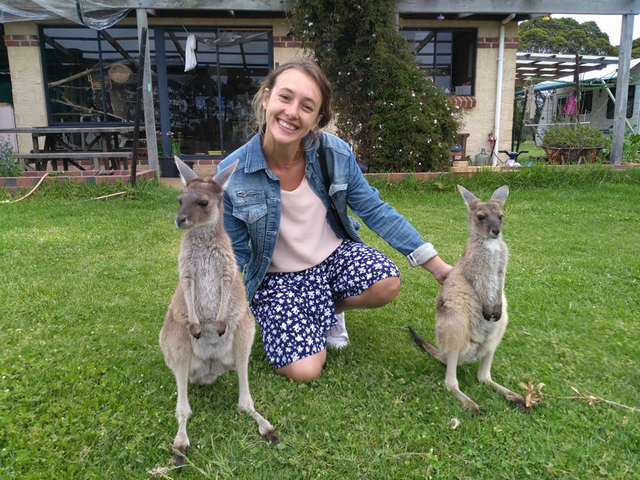 Caroline tries to instill some values ​​in these Australian animals. They are very focused and listen carefully. Then directly, we go to the meal! 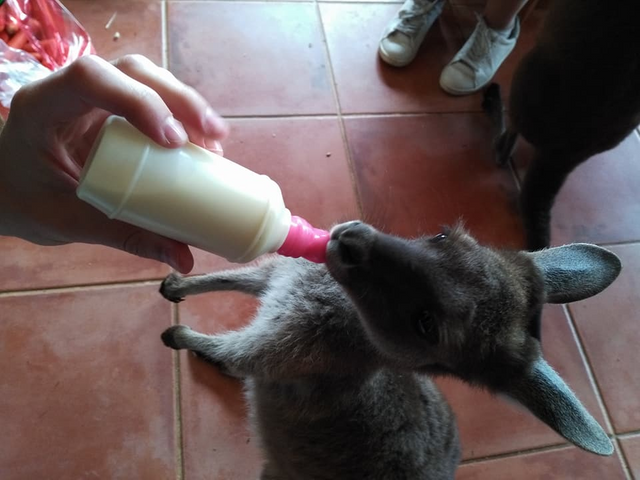 Of course it is the kangaroos who eat. Three small bottles of milk a day in addition to their seeds and vegetables, it's their diet. In addition, they graze the grass of the property. The kangaroo just below, it's Tilly! He does not go outside because he is too scared (except for walks). He was collected because he lost his mother very young after a shot of a hunter. This is an ingenious idea! 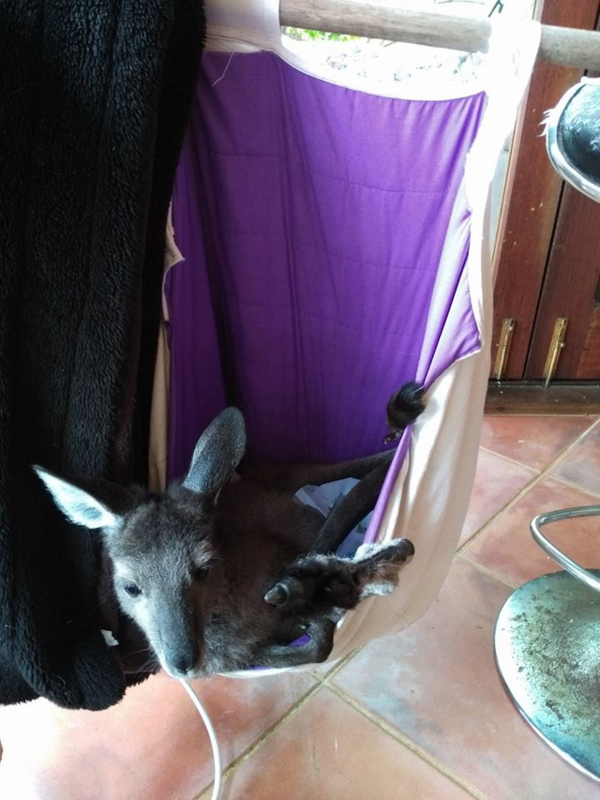 Kangaroo babies sleep in a pocket like their mother's but made by the man. 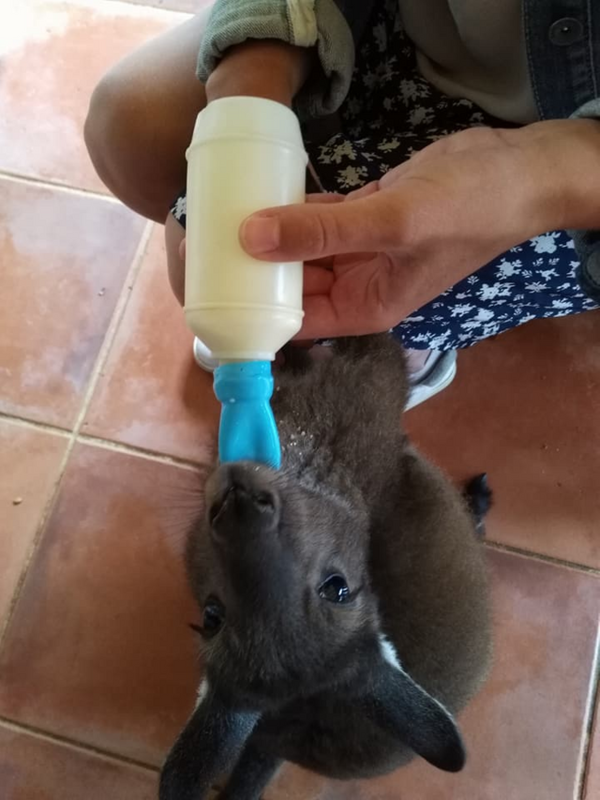 Our job is to walk the kangaroos, watch them, feed them, put them to bed and Sharon asks us to give them a lot of love! 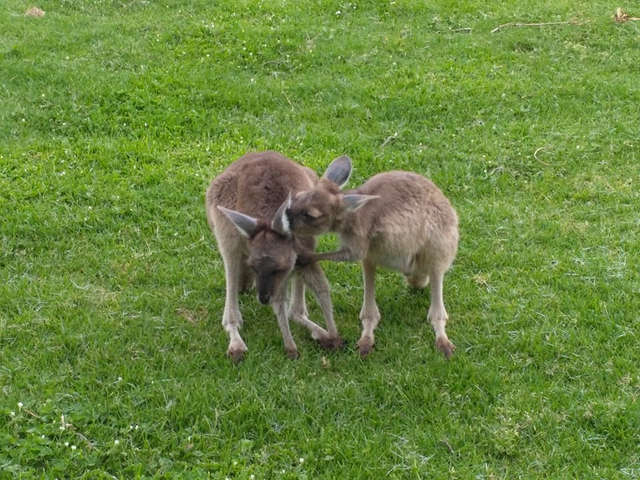 In full stroll, the kangaroos behave like little dogs. That is to say they follow us all the time because they take us for their mom. One day Sharon was not there, she gives us the mission to take the kangaroos around the sheep's pasture. We have great difficulty in bringing Tilly with us but arrive after a while. All the kangaroos are in the field and suddenly the smallest sheep of the herd starts to charge the kangaroos. They get scared and come back to their neighborhood. Except that the sheep does not stop there! He decides to get out of his meadow and goes straight to the house. I start running to stop him! Nevertheless, the sheep ends up running on the sofa in the living room ... A beautiful memory that made us a little less laugh this day! We have a lot of free time and take the opportunity to visit the region, in the next article I will make you discover this little corner of paradise. How fun to get to help care for those babies! She is a good woman and I'm sure you learned a lot. Great photos! Your welcome ! 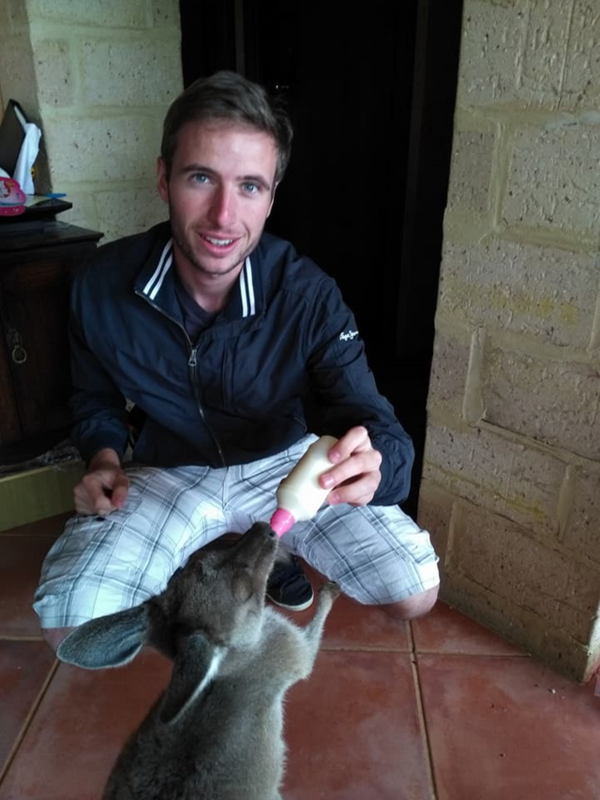 :) I hope you will meet kangaroos like us in your future!